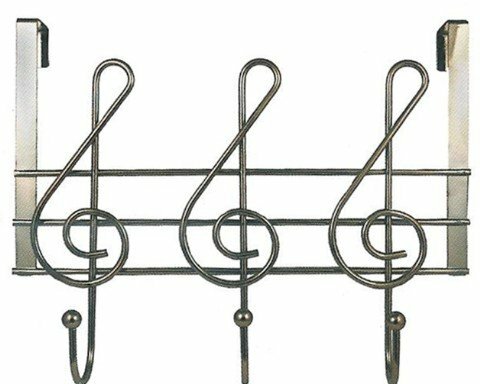 These awesome musical notes will add some style and harmony to your decor, while offering you a handy place to hang you hat (or your robe, your towel, your shirt, your robe, your jacket, your coat...!! Makes such a great gift for the music teacher or musician in your life. Fits over any standard door. Three hooks, each with a ball end to protect your fabrics. Sleek metal construction. Measures approximately 13" across, 10" tall. Perfect in the bedroom, bathroom, pantry, or closet.